If you want to win the hearts and minds (and dollars) of consumers in their micro-moments, you have to do more than just be there. You have to be useful too. That means connecting people to what they’re looking for in real-time and providing relevant information when they need it. Mobile adds a rich layer of context on top of intent that lets marketers create even more relevant messages in micro-moments. For example, when someone searches for digital cameras, are they at home, on the street, or actually in your store? Is it 6 p.m. Friday or 6 a.m. Monday? The answers to questions like these play a role in determining what problem consumers are trying to solve, what creative they'll respond to, and what marketers need to think about when trying to engage them. Let’s look at four key types of micro-moments and dissect how being useful can translate into successful content creation and mobile strategies. From "How can I eat healthier?" to "What is my credit score?" or "What's the best SUV for toddlers in tow?" 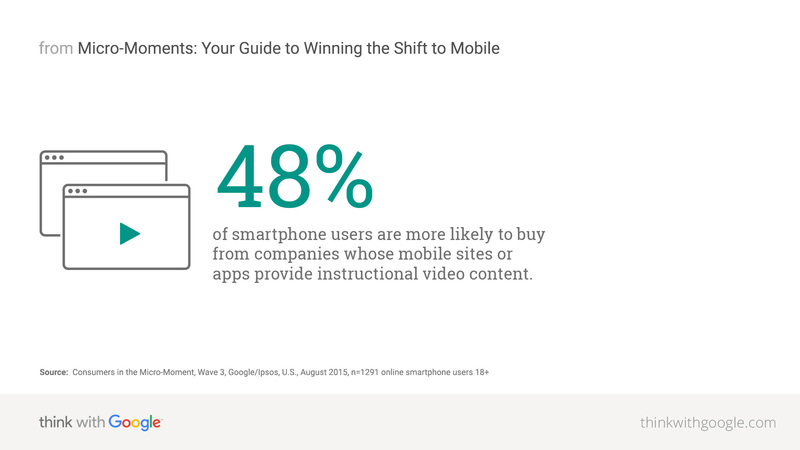 consumers are turning to their phones to learn in the moment, even when it’s for larger purchases with higher stakes. Why? 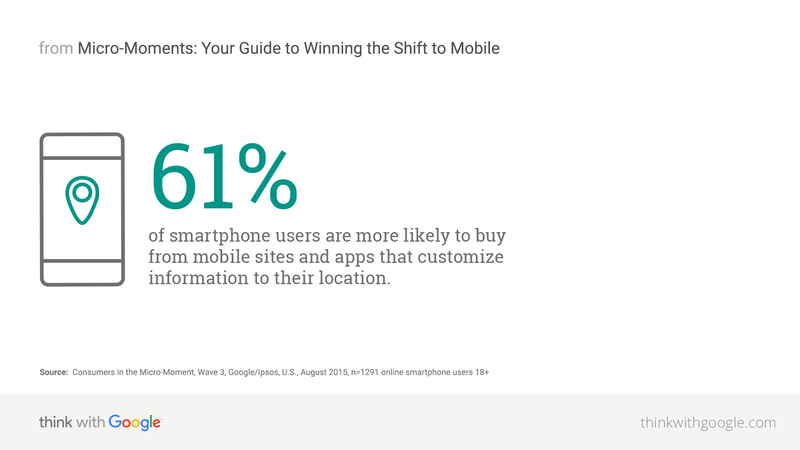 Because mobile helps them chip away at a long purchase journey. Helping them find answers to their questions can make or break a sale and influence a consumer's perception of your brand in the future. Realtor.com recently revamped its content strategy by introducing a helpful video series for house hunters. Realtor.com’s marketing team realized that searching for home listings is only one step in a long (and often confusing) homebuying journey. To be useful to first-time homebuyers, it enlisted the help of actress Elizabeth Banks to create step-by-step videos to walk consumers through the homebuying process. The two-minute videos resonated with consumers, driving 400k YouTube views in the first three weeks. "Our knowledge that many buyers turn to the web first for help navigating one of life's biggest decisions, and the fact that many first-time buyers prefer to consume entertainment digitally and on-demand drove the development of this episodic content,” said Andrew Strickman, Realtor.com’s Head of Brand and Chief Creative. See more on Realtor.com's YouTube channel. Give them what they want by using location signals to highlight relevant locations, store inventory, and driving directions in your ads and mobile site, and also within your app content. The brands that do this well will get the lion’s share of the rewards. Since 1972, Argos and its shops have been a favorite in the U.K. Customers walk in, order from the catalog, and then wait for their item to be brought out from the store room. Three years ago, Argos realized it needed to modernize its marketing strategy to include digital and mobile. After putting their inventory online, Argos implemented Local Inventory Ads on mobile to connect with consumers near their store locations and drive them in store by highlighting in-stock inventory. In other words, if a busy mom sees a toy in an Argos ad, she can find it on her smartphone, reserve it online, and pick it up at the store on her way home from work. As a result of its digital-focused strategy, mobile commerce grew by 38% last year, and 46% of the company’s total sales come from online shoppers. This type of micro-moment is all about the “how-to.” It’s the I-need-to-fix-a-leaky-pipe moment or the I-want-to-try-a-new-hairstyle moment. Consumers are looking for immediate help with getting something done or learning something new in these I-want-to-do moments. Home Depot marketers figured out years ago “do-it-yourselfers” were turning to their phones to learn everything from “how to tile a bathroom floor” to “how to build an outdoor fire pit.” Many consumers ended up searching for answers on YouTube. So to be more useful in these I-want-to-do moments, Home Depot began to build out a better content marketing strategy by creating a “how-to” collection on YouTube. Today, the collection has hundreds of videos, with the top 10 videos each reaching a million views or more. The full Home Depot “how-to” collection has received more than 43 million views. These are, of course, huge. Thanks to mobile, I-want-to-buy moments can happen anytime and anywhere. In fact, 39% of consumers report having made a purchase in their kitchen, another 28% in their car.12 From the dad who wants to buy cough syrup to the woman who wants the same shade of lipstick she bought the last time, these consumers are ready to buy from whichever brand makes it easiest to purchase. Speed counts: 58% of smartphone users are more likely to buy from companies whose mobile sites or apps allow them to make purchases quickly. Clues like location, time, and device can help marketers be useful in someone’s I-want-to-buy moment, giving them the confidence they need to make the purchase. Your customer should be empowered to purchase in whatever way suits their needs, whether in-store, on mobile, via a call center, or across devices. Consider this: When Rue La La recently realized that 40% of its revenue was coming from mobile (and Android users made up a growing portion of this base), the company added Google Wallet Instant Buy to their app to create a 2-click checkout experience. Today, Rue La La app users are four times more likely to convert than other Android shoppers.